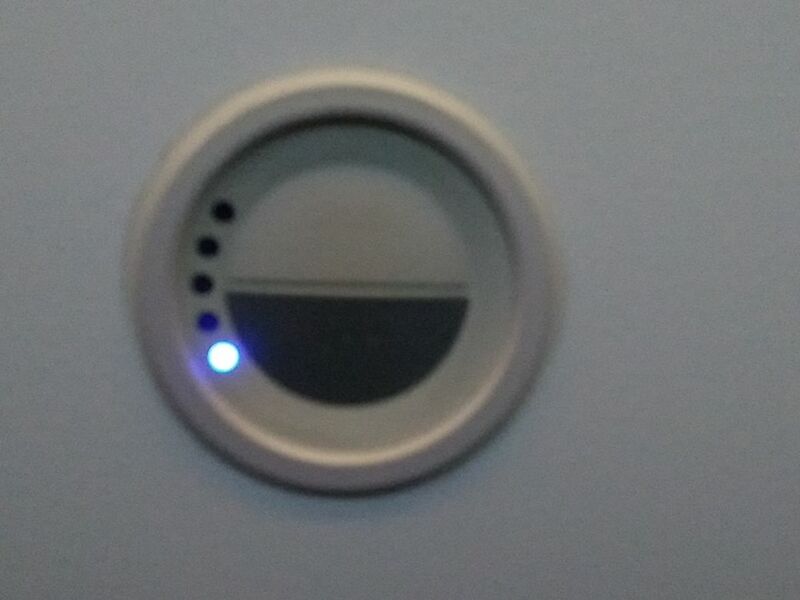 On the last two planes I took, just last week, there was the control shown in this (very blurry, sorry) photo. The planes were Boeing 787-8. It seems to be made of two half-circle buttons. On the first plane, pressing the half buttons moved the blue light up or down. On the second, nothing happened. Nothing else seemed to change. I paid attention to the window and cabin light but nothing happened. Since these planes had no apparent window shade, I thought the control would operate a mechanism to act as shade. What is this control for? What is doing something? Could it have been not operational on one or both planes? Seems an unlikely coincidence, particularly since the behavior of the blue light was different. It is windows shade adjustment. In the new B787 lines, you press up/down button to make the windows darker or brighter. The process takes minutes so you might not be able to realize it. It's not as quick as a curtain. The crew can control it to simulate the night on long flight. So the button will end up being useless during "night mode". They can also control it to brighten all windows during landing. This replaces the instruction to passengers to open all windows before landing (the usual routine; besides putting up tray tables and putting down arm rests). The rationale is that in case of an evacuation, passengers should be able to see whether evacuation on their side of the plane is safe i.e. no fires. Not the answer you're looking for? Browse other questions tagged aircraft or ask your own question. What does Ryanair do with airplanes in winter?